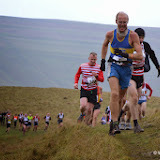 33 year old Ben Mounsey had only previously won a team gold medal from 2009, so he was overjoyed and the smile never left his face on winning the individual title and trophy at Great Whernside (4m/1555'). Ben used his climbing ability to open a good lead by the misty summit and finished with 46 seconds in hand over silver medallist Ted Mason, the 2014 BOFRA champion with Calder team mate Gavin Mulholland in the bronze medal position. 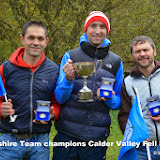 Calder Valley Fell Runners with Yorkshire stalwart Karl Gray in fourth easily won the team gold medals and in fact Karl and Gavin have been a part of all Calder Valley's four wins, 2009, 2010, 2011 and now 2014. Stalwart Karl also has eight individual medals to his name, four bronze, three silver and a gold from 2010 when the champs was at Holme Moss. "I'm absolutely over the moon and still smiling about the win. As a proud Yorkshireman winning the annual championship race has always been on my wishlist. We set out to win the team first and foremost as we're all in good form at the moment and I was quietly confident about the win as I'd ran really well in both relays recently. My plan was to set off fast so I didn't have to get in a battle with Ted or Karl on the descent. I did wonder if i'd overcooked my sprint start but I felt really strong on the climb and just tried to keep it going. When I turned at the top I just gave it everything on the way down and was surprised how much of a lead I had by the final field. I was definitely running scared! Ha ha. Winning the Yorkshire champs is one of the best things I've achieved without a doubt and winning the team was the icing on the cake," said a beaming Ben. Victoria Wilkinson of Bingley Harriers made it a hat trick of titles by retaining the Ladies Norman Berry Yorkshire Championship trophy and gold medal at the Great Whernside race and surprisingly won her first ever team gold medal with backup from 2010 champion Aly Raw and Lesley Watson, although Bingley have won the team awards 3 times. Victoria the 2014 English and joint British champion had a storming run breaking the course record by eight seconds for the second year at the race with 34.29 and finishing 11 overall. It's been a great year for Helen Berry having won the British and English FV40 championship and finishing second to Victoria in the English, Helen the Yorkshire champion in 2012 finished with the silver medal to add to her silver from 2010 and bronze from last year, while FU23 Caroline Lambert took the bronze medal. In the FU23 championship, FU18 champion back in 2010 Caroline Lambert of Wetherby Runners won the title for the second year and retained the Sarah Rowell salver Trophy, following in the footsteps of Victoria Wilkinson who won the FU23 title in both 1997 and 1998. 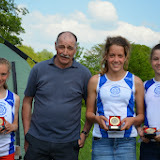 FU18 champion last year Annabel Mason won the silver medal, whilst Molly Travis added to Calder Valley Fell Runners medal haul with a bronze medal, Molly's only other medal was in 2011 a silver from the FU16 category. The shock of the event was that NO MU23's from Yorkshire took part in the race. Many thanks to Martyn Speight of The Wharfedale Clinic and Mike Ayers of Precision Pest Management for sponsoring the Yorkshire Fell championships. Championship Gold, Silver & Bronze medals to first 3 in each male and female category. Ages for all categories are as at 1st January 2014. At Witton Park, Blackburn, Lancs. Yorkshire once again dominated the 17th UKA Fell Inter County Championships with three individual golds, three silvers and a bronze held at Witton Park in Lancashire. 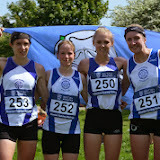 But it was in the team event that Yorkshire were most golden, winning four out of the six team races. 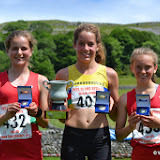 FU14 Yorkshire fells champion, Emma Clapton got the Golden Express rolling with the individual FU16 gold finishing behind non county runner, Lauren McNeil and with Lucy Haines in fourth the Tykes won team gold from Greater Manchester and Lancashire. Erica Byram finished fifth to round up Yorkshire's finishers, although only two score in the team, all three get medals. Reserve Jemima Elgood showed the Yorkshire selectors her talent by finishing just ahead of Erica. Yorkshire FU18 finished fourth team with runners Lucy Williamson, Ellie Crownshaw and Issy Wharton. The combined MU16 & MU18 race saw the Yorkshire express train reach full speed with MU18 Max Wharton defending his Inters title from Ciaran Lewis of South Wales, non county runner Jacob Adkin and MU16 Yorkshire champion and twice Inter silver medallist Lewis Byram, who collected the bronze. 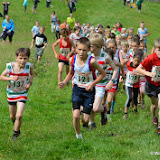 Max for good measure had won the gold medal at the Yorkshire 800m T & F championship the previous day. Another non county athlete Liam Burthem finished next with Yorkshire lad Tom Peel close on his heels. Jack Denton who finished fifth last year had the run of the day winning gold in the MU16 race from Elliott Matier of Cumbria and Cai Linton Davies of North Wales, Jack also led Yorkshire to more team gold backed up by Seth Waterman in sixth and Chris Law who suffered in the heat to finish 16th. Katie Walshaw, Emma Clayton, Victoria Wilkinson, Holly Page and Caroline Lambert collected team gold for the tenth year for the county. Cumbria finally found another winner in Sarah Tunstall, ten years after three times winner Lou Sharp now Roberts had won. Sarah crossed the finish line kissing her beloved Cumbrian vest. Yorkshire women finished in the next three positions with Katie Walshaw taking the silver after bronze last year, fourth in 2012 and eighth in 2011 showing her improvement. In bronze just back from a foot injury sustained in November, Emma Clayton, 25, last years Inters winner was happy with her run considering she had only managed seven weeks training, although Emma did receive the most fizz being sprayed at the Yorkshire celebrations. 2013 British and English and twice Inters champion, Victoria Wilkinson wrapped up the scoring team places for Yorkshire with fourth, Victoria actually took part in the first ever Women's Inter Counties at Arrant Haw, Sedbergh in Cumbria way back in 1998 where she finished with silver behind Jessica Turnbull. Holly Page rounded up the Yorkshire girls with a fine seventh. The FU23 race was won by non counter Mel Hyder, so gold went to Scout Adkin of Scotland East with the silver to Yorkshire's Caroline Lambert and bronze to Lucy Crookes of Leicestershire. Yorkshire lass Zara Knappy, another non county runner finished third just behind Scout Adkin, but Yorkshire had no idea she was running. Middlesex were the surprise golden men's team winners with Shaun Dixon taking individual gold, Chris Smith the bronze and with Richard Phillips in 19th the team was secured by one point ahead of Lancashire on 24 and Yorkshire on 25 points. Pendle Hill and Coniston English championship race winner, Tom Addison, running in his new Yorkshire vest finished with the silver medal, showing that proper fell runners can mix it with the best even if it's not on a real fell race route. For Yorkshire in sixth came Tom Adams, 17th came Mark Addison, a late replacement for dairy farmer Jack Simpson who was injured the previous day on his farm, 26th came Tom Saville who finished fifth MU23 and in 44th came Joe Mercer, who was another who found the heat a major issue. The big debate of the day was should a venue like this be used as the Fell Inter Counties Championship surely we have enough fell races in the calendar that could be used.